The Enterprise-class TES-1885U 18-Bay NAS Enclosure from QNAP is designed so that businesses may choose from two operating systems - either the FreeBSD-based QES or Linux-based QTS - and, based on their needs and goals, deploy the proper OS on multiple TES-1885U units. While QES supports ZFS for the strong reliability and allows near-limitless snapshots, block-level data deduplication and real-time data compression, QTS features Qtier Technology, SSD cache and an abundance of apps to realize storage efficiency and diverse usage applications. Please be aware that to change the NAS operating system after completing setup, it is necessary to re-initialize the hard disks and delete all stored data. A remote backup is required before switching the NAS operating system. The TES-1885U holds larger-capacity 2.5"/3.5" hard drives in twelve drive bays that support SAS-3 12 Gb/s and SATA III 6 Gb/s and also supports faster SSDs in six 2.5" SATA III bays. While the twelve 2.5"/3.5" drive bays can only be used for data storage, the six 2.5" bays can be used for caching, high-performance storage pools, or the QES OS drive. To manage the data and operating system, this NAS is powered by a 2.4 GHz Intel Xeon D-1521 quad-core processor along with 16GB of 2133 MHz DDR4 ECC RAM. This version of the TES-1885U is also outfitted with two 10 Gigabit Ethernet SFP+ ports, four Gigabit Ethernet ports and three PCIe 3.0 slots and one PCIe 2.0 slot, each of which supports 10 or 40 Gigabit Ethernet adapters and PCIe NVMe SSDs. You can configure your drives in a RAID array, such as RAID 0, 1, 5, 6, 10, 50, 60, RAIDTP, Triple Mirror and Global Hot Spare, providing additional storage options that might not be available on other storage units. You can activate the Tiered Storage feature, which moves frequently-used "hot" data to high-performance storage tiers and less-accessed "cold" data to the higher capacity drives. QNAP's TES-1885U is powered using dual redundant 450W power supplies that operate at 90~264 VAC and stays cool using four 6cm smart cooling fans. Included are four Ethernet cables, two power cords, flathead screws for 3.5" and 2.5" drives and an A03 Series Chassis Rail Kit. Protection is provided by a limited 5-year warranty, which is inclusive of 3-years of global coverage. Powered by a 14nm Intel Xeon D 64-bit SoC processor with an integrated PCH, 16GB of 2133 MHz DDR4 ECC RAM and with two built-in 10 Gigabit Ethernet SFP+ ports, the 12 Gb/s SAS-enabled TES-1885U delivers outstanding performance for data transmission and applications. With a thermal design power of only 20-65W, the TES-1885U fulfills demands for both performance and energy saving. 14nm energy-efficient SoC, supports DDR4 RAM and PCIe Gen 3.0 per-lane throughput. Supports 12 Gb/s SAS hard drives and SSDs for fast data transfer and reliable storage. Four hot-swappable 6cm cooling fans can be quickly and easily replaced. 2 x Built-in 10 Gigabit Ethernet SFP+ Ports Boosts iSCSI/NFS/CIFS network transfer for virtualization applications, data backup/restoration and massive data transmission. Three high-speed PCIe Gen 3.0 and one PCIe Gen 2.0; supports 10GbE/40GbE adapters and PCIe NVMe SSD. The TES-1885U is backed by a limited 5-year warranty with 3-year global warranty inclusive at no extra cost. The TES-1885U provides flexibility for choosing between reliability and versatility. The QES operating system is suited for enterprise-level storage with maximized business continuity, or the QTS operating system for enjoying application storage for greater functionality. The TES-1885U supports the QES (QNAP Enterprise Storage) operating system, which is based on the simple and efficient FreeBSD kernel and the ZFS file system that has been shown through years of experience to be more suitable for high-end enterprise applications. Continuing the same user experience with the QTS operating system, QES provides business users with an easy learning curve to quickly deploy the TES-1885U and provides a good storage solution jointly with the current QNAP NAS. The TES-1885U features ZFS, a combined file system and logical volume manager, to support various advanced functions for high-end enterprise storage, including powerful storage expansion, flexible storage pools, RAID-Z for data protection, simplified management, high-performance SSD cache, nearly limitless snapshots and cloning, data deduplication, in-line compression, self-healing and thin provisioning with reclaim for optimized utilization for virtual machine storage. ZFS is designed with a focus on data integrity and uses its end-to-end checksums to detect and correct silent data corruption caused by hardware defects, bugs in firmware or metadata errors, effectively protecting user's data. 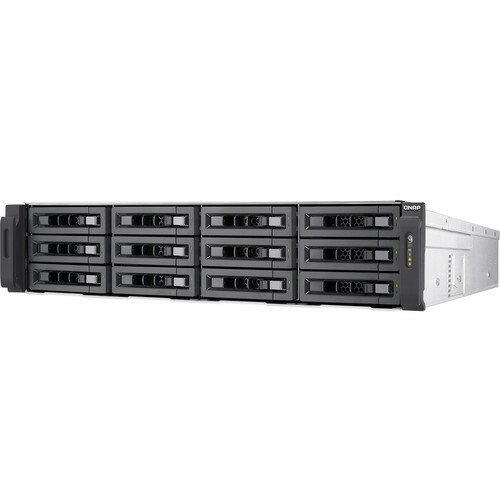 All-flash storage featuring high-performance random I/O is advantageous for databases, online transaction processing (OLTP) and virtual desktop infrastructure (VDI) applications. Though the cost of all-flash storage is higher than using normal hard drives, data deduplication and compression technology can greatly assist in storing more data in less storage space with greater cost-efficiency and performance gains. Using VDI for example, there could be over 90% duplicate data from OS images and applications that are spread over virtual desktops. The TES-1885U supports block-based data deduplication to optimize storage usage from redundant data. Deduplicated virtual desktops become easier to be cached to achieve optimal virtual desktop performance. In-line data compression helps shrink data size, further optimizing storage usage. For mastering storage in a virtualized environment, the TES-1885U provides businesses with a cost-effective remote virtual desktop platform and mission-critical information warehousing. The TES-1885U supports up to 65,536 snapshots for iSCSI LUN and shared folders. When executing a remote snapshot backup, it only needs to transfer changed data and can use deduplication and compression to significantly reduce the amount of transferred data. The TES-1885U can provide remote backup SnapSync for snapshots at the shortest interval of every five minutes, fully supports VMware vCenter Site Recovery (SRM) technology, provides Storage Replication Adapter (SRA) for SRM and provides enterprise-class remote backup & disaster recovery solution to fulfill business continuity. QNAP NetBak Replicator is easy-to-use and VSS-aware backup software helps businesses to create complete backups in datacenter and virtualization environments without needing to purchase expensive and complex commercial software. To build a QNAP Snap Agent and VSS Hardware Provider operating environment, all applications (including VSS Service, Requestor, Provider and QNAP Snap Agent) can be deployed with VSS-Aware applications on the same server and the minimal requirements are only one TES-1885U and one server for it to be operational. The TES-1885U supports VMware vSphere 6.0 and Citrix XenServer 6.0 and is compatible with Microsoft Hyper-V, benefiting flexible deployment and management in virtualization environments. The TES-1885U supports VMware VAAI and Microsoft ODX to increase performance by offloading server loading for ESXi server and Hyper-V respectively and supports QNAP vSphere Client plug-in, Web plug-in and QNAP SMI-S provider with enhanced efficiency of operations and management in virtualization applications. When running the QES operating system, the TES-1885U provides good backup storage for the dual-controller Enterprise ZFS NAS using SnapSync. If the Enterprise ZFS NAS unexpectedly stops, the TES-1885U can immediately recover all the backed up data locally to take over operations and services with maximized uptime. It prevents the downtime required to restore data from a remote QTS NAS/rsync server back to the recovered Enterprise ZFS NAS, making the TES-1885U a worthy option to pair with the Enterprise ZFS NAS as a backup NAS to achieve strong recovery time objectives. The QTS operating system not only supports storage optimization with Qtier for driving auto-tiering, block-based snapshot and SSD read/write cache, but also provides rich business-ready applications and functionality, providing a comprehensive all-in-one NAS solution. QNAP's Qtier Technology empowers the TES-1885U with Auto Tiering that helps continuously optimize storage efficiency across SSDs and SAS/SATA drives. With Auto Tiering, the TES-1885U can automatically move frequently-used "hot" data to high-performance storage tiers and less-accessed "cold" data to lower-cost, higher-capacity drives, making the TES-1885U an extremely efficient shared resource. SSDs and SAS/SATA drives can also be configured as independent partitions for different applications, ensuring a sufficient throughput level for every application. The TES-1885U supports SMB/CIFS, NFS and AFP protocols for file sharing across Windows, Mac and Linux/UNIX networks. Data, logs and ISO images of CDs and DVDs can be centrally stored on the TES-1885U and protected by an integrated antivirus solution. The Windows AD and LDAP services enable system administrators to configure user permissions by using existing Windows AD server, LDAP server, or NAS build-in LDAP services. The TES-1885U supports SAMBA v4 and can act as a domain controller for Windows. The TES-1885U offers flexible backup solutions for Windows and Mac users, Volume/LUN snapshots, Snapshot Replica and Clone and disaster recovery solutions including RTRR, rsync and cloud storage backup (Amazon Glacier, Azure Storage, Google Cloud Storage, Google Drive, Microsoft OneDrive, Dropbox, Amazon Drive, Yandex Disk, Box and Amazon S3/OpenStack Swift/WebDAV compatible cloud services) are also included. QTS Storage Manager features an easy-to-use web-based snapshot tool for you to easily back up and restore data on the TES-1885U back to any point of time to prevent losing important data. You can take snapshots for both volumes and LUN (up to 256 snapshots per volume or LUN and maximum 1,024 snapshots per NAS), efficiently replicate volume/LUN snapshots to remote servers by only copying the changes made and quickly clone a volume/LUN snapshot as a local volume without interrupting current system operations. You can even set up the system to automatically take a snapshot of the volume before backup via RTRR/rsync, even when files are open. Virtualization Station allows you to directly host virtual machines (VM) on the TES-1885U and access them via a web browser or VNC. Virtualization Station supports multiple operating systems, fast VM creation, VM backup & restoration, VM import/export, snapshot and Device Management for centrally managing VMs. Virtualization Station allows the TES-1885U and VMs to share the same LAN port and high-speed virtual switches greatly increases transfer speeds between VMs as well as between VMs and the data stored on the TES-1885U. The TES-1885U also features Container Station, which integrates LXC and Docker lightweight virtualization technologies. You can operate multiple isolated Linux systems on the TES-1885U as well as download apps from the built-in Docker Hub Registry. What's more, QNAP provides comprehensive "QIoT Containers" for Container Station as a platform with countless hands-on containerized apps that helps developers easily apply, rapidly develop and conveniently deploy IoT applications. Besides using expansion enclosures, there is an additional option to expand NAS storage capacity. QNAP VJBOD (Virtual JBOD) is network-based JBOD, allowing you to expand the storage capacity of a QNAP NAS using other QNAP NAS units. You can mount iSCSI LUNs from a QNAP NAS to the TES-1885U as local disks and create virtual storage pools and volumes for operating NAS functionalities, such as creating and reverting snapshots, indexing multimedia files into the media library and even further creating iSCSI LUNs. With VJBOD, you can centrally utilize the storage space from multiple QNAP NAS units and manage it with the interface on the local NAS. The Helpdesk app allows you to directly send support requests to QNAP engineers and grant engineers remote access to your NAS over a secure 256-bit encrypted connection to fix serious issues. The Helpdesk also consolidates a wealth of useful information including tutorials, FAQs, online resources and device compatibility lists. Whether you are new to QNAP NAS or an expert user, you can easily find helpful advice and information to effectively solve problems. QRM+ is QNAP's Centralized Remote Server Management solution designed for IT teams. It provides a web-based solution - accessible from almost any web browser - to discover, map, monitor and manage all of the critical computing devices on the network such as servers, PCs, embedded PCs and thin clients from a single-point. Supporting IPMI 1.5 and 2.0, QRM+ provides remote KVM (Keyboard, Video, Mouse) for certain IPMI devices and supports tracking every action using KVM recording and playback. With centralized management by QRM+, IT infrastructure and device security is enhanced and troubleshooting & network resource performance analysis is greatly simplified. Qsync provides multiple ways of file synchronization and group file sharing, greatly enhancing the flexibility of collaboration. Any file uploaded to the TES-1885U will be made available for all linked devices, such as computers, laptops, or mobile devices. Qsync is especially useful for frequent travelers to manage files and always have the most up-to-date files on different devices. More advanced features include: syncing shared folders or team folders to increase collaboration; centralized configuration that allows for remotely erasing the Qsync folder on a lost device to avoid data breaches and even restoring it after the device is retrieved. Surveillance Station is a professional network surveillance Video Management System (VMS) that offers a user-friendly management interface, over 3,000 compatible IP camera models and expandable IP camera channel licenses. It supports real-time monitoring, video & audio recording and playback with a wide range of customizable settings. You can also install the Vmobile app on your iOS or Android devices to manage monitored channels anytime and anywhere to safeguard your office environment, or install the Vcam mobile app to turn your device into a network camera to instantly record to your TES-1885U. The TES-1885U includes 8 free IP camera channels and you can expand up to 80 channels by purchasing additional licenses. The TES-1885U has a built-in App Center that provides over 100 apps, including tools for backup/sync, business, content management, communications, downloading, entertainment and much more. You can freely install apps as needed to expand your TES-1885U's functionality. 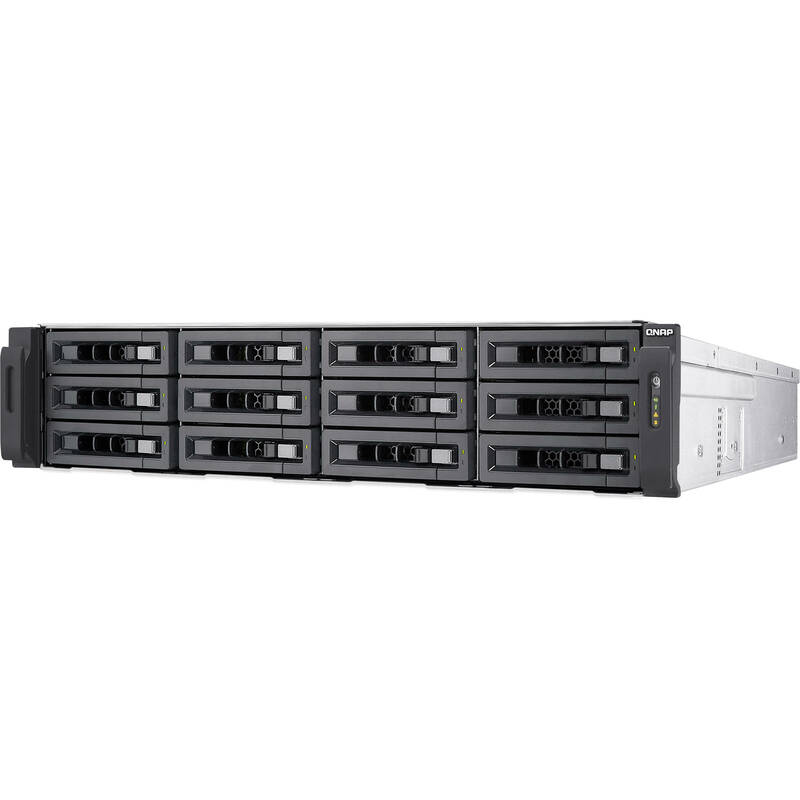 The TES-1885U supports efficient capacity expansion by cascading multiple QNAP RAID expansion enclosures to meet the needs of growing business data, providing businesses a cost-efficient storage solution for large data archiving and virtualization applications. The TES-1885U can support up to eight REXP-1220U-RP or REXP-1620U-RP expansion enclosures for up to 140 total storage drives (NAS + expansion enclosures). Note: Slot 4 provides the width of PCIe Gen 3.0 x8 when slot 3 is not in use. Slot 4 then provides the width of PCIe Gen 3.0 x4 only when an expansion board is installed in slot 3. Box Dimensions (LxWxH) 29.0 x 23.4 x 12.4"